Delhi 4th round seat allotment results 2018: Directorate of Training and Technical Education (DTTE), Delhi has recently rolled out the merit list for ITI admissions. Delhi ITI Fourth round Counseling process results placed on 9th August. 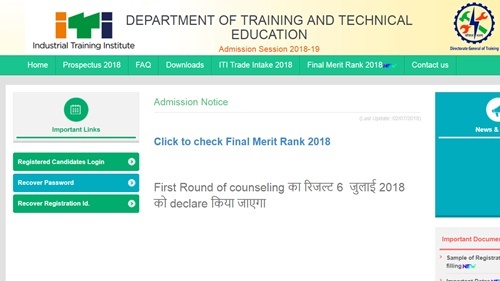 The Delhi DTTE official portal is displaying that the Delhi ITI First round Counseling process will be started from 14th July onwards. Candidates shortlisted in the merit list can get ready for the 2nd round Counseling process. Students with good merit will be given first priority in the Counseling process. Candidates will have to appear for the ITI Counseling with all original documents. Also, the candidates allotted admission in the 2nd round will have to pay the admission fee to lock the seat. Candidates can check more details from the DTTE official website, itidelhiadmissions.nic.in. Counseling Round 4 Result has been announced. Directorate of Training and Technical Education, Delhi is the technical education board that offers the courses like ITI/Diploma/Polytechnic etc for the aspirants. The board offers admissions for aspirants based on the merit in their 10th/12th classes academics. Students shortlisted in the merit list will get admission in ITI course in their interested branch in DTTE affiliated colleges. The board conducts various rounds of Counseling process to offer admission to the aspirants. The DTTE Delhi will conduct the ITI 2nd round Counseling result publish on 20th July, as per the update from the official portal. Hence candidates can get ready to proceed with the seat allotment/Counseling procedure. Reporting For Fourth Counselling at Allotted ITI will start from 08/08/2018 (Wednesday 12 PM ) to 10/08/2018(Friday). Candidates who got shortlisted in the Delhi DTTE merit list will be shortlisted for Industrial Training Courses in NCVT and SCVT. Initially, the 2nd phase of Counseling process will be completed on 20th July. Candidates who do not get the admission in the 2nd round will have to appear for the 3rd round. Candidates who do not get admission in 2nd round Counseling process can try for 3rd round to get admission in ITI courses. Candidates who got allotted admission in 2nd round Counseling will have to report at the allotted colleges from 23rd, 24th July. And the 3rd round of Counseling process will take place from 26th July. Check more information regarding the Delhi ITI Counseling schedule 2018 from the following table. Sir mera no. Kab aayega meri rank 28428 plz sir tell me . 4th councling. Kb aayegi us m no. Nhi aaya to kya krna hoga . Sir mera no. Kab aayega meri rank 28428 plz sir tell me .